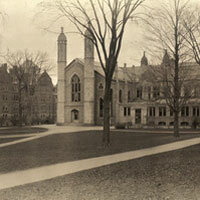 Gore Hall was a historic building on the Harvard University campus, designed by Richard Bond. Harvard's first dedicated library building, a Gothic structure built in 1838 of Quincy granite, it was named in honor of Harvard graduate and Massachusetts Governor Christopher Gore. When, in 1846, Harvard President Edward Everett was asked to design a seal for the newly incorporated City of Cambridge, he made Gore one of two icons (the other being the Washington Elm) encircled by the motto Literis Antiquis Novis Institutis Decora. "It can be translated as: 'Distinguished for Classical Learning and New Institutions.'" When the original Gore Hall was demolished in 1913 to make way for Widener Library, its name was transferred to a new Gore Hall, a freshman dormitory then under construction and now part of Winthrop House. ^ Cambridge Historical Commission. "About the CHC. Frequently Asked Questions". City of Cambridge. Archived from the original on May 16, 2014. Retrieved July 26, 2014. ^ Spencer, Thaxter (November–December 2011). "Christopher Gore". Harvard Magazine. ^ Harvard University (1949). Education, bricks and mortar: Harvard buildings and their contribution to the advancement of learning. Harvard University. p. 29. Harvard University. Library (1905). An Index Guide to the Shelf Classification of the Harvard College Library ... library. Retrieved November 15, 2015. Cutter, C.A. (1869). The New Catalogue of Harvard College Library. Retrieved November 15, 2015. Kent, A. (1983). Encyclopedia of Library and Information Science. Taylor & Francis. p. 328. ISBN 9780824720353. Retrieved November 15, 2015. "Round Point Pinnacle at Appleton Farms". 25 May 2009. Retrieved 12 November 2017. Text gives locations of three other pinnacles salvaged from Gore Hall.